​PEPTIDES are the fundamental element that powers the Melanoboost product range beyond the capabilities of any other sun tan lotion, oil or cream. These smart active ingredients are designed to boost the skins melanin levels, activate the natural tanning process, and accelerate tanning results like you have never seen before. Use Bronzan Accelerating Tanning Capsules all year around to keep your Melanin levels high then as summer approaches use your Melanoboost Peptide Sun Tanning Products to amp up your Sun Tanning Regime. 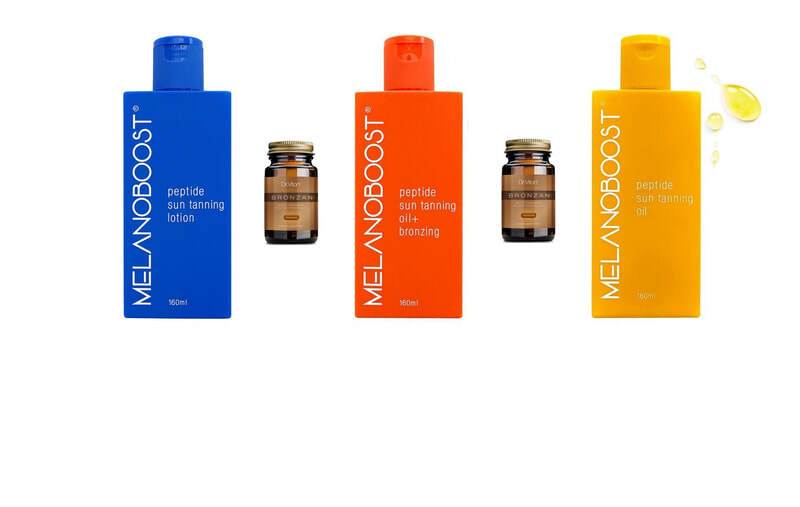 Melanoboost Peptide Sun Tanning Oil combines Melanoboosts advanced peptide technology with 8 nutrient rich oils carefully selected for their superior skin conditioning properties and light weight textures, Melanoboost Peptide Sun Tanning Oil promotes maximum tanning results with minimal UV exposure. MINIMUM SUN - MAXIMUM TAN. Need to step up your sun tanning game but don't have a sun tan accelerator that actually contains active ingredients to boost your tan? Look no further. Melanoboost Peptide Complex is a unique combination of active ingredients powered by peptides that promotes higher concentrations of melanin in the skin to accelerate tanning with very little UV exposure. It is this use of peptides that differentiates Melanoboost from other sun tanning oils, and what makes its performance so ground breaking - accelerated tanning at its best! There is an obvious difference in texture between oils and lotions, and how they feel and look on the skin. Some people may like the way that oils have the ability to stay on the surface of the skin for a longer period of time, particularly during UV exposure when intense moisturisation counts the most. They may also like the way that oils have the unique ability to instantly enhance a natural sun tan with a glistening luminosity that's hard to beat. Others may prefer the fast absorption rate and the light, weightless feel of a water based lotion, especially pre and post sun exposure when feeling refreshed and replenished is key to comfortable skin, and looking visibly hydrated is paramount to a healthy looking natural sun tan. Landing in a bright YELLOW bottle, Melanoboost Peptide Sun Tanning Oil introduced Peptides to sun tanning with Game Changing Effect and sent the industry into melanin boosting overdrive. Melanin is the pigment which makes our skin tan, Melanin is usually only produced when our bodies are exposed to UV light. Melanoboost uses synthetic Peptides designed to mimic this naturally occurring function without exposure to UV light. The more abundant our melanin levels pre-sun exposure the more effectively we are able to tan with minimal UV exposure. Our bright CORAL bottle, Melanoboost Peptide Sun Tanning Oil + Bronzing was developed to help those that really struggle to tan. Great for fair skinned people who need additional tanning help and don't want to hit the beach pale, Melanoboost Peptide Sun Tanning Oil + Bronzing has the addition of sunless tanning actives to provide a temporary faux tan while you work on your real tan. It is also great for those who want to take their natural sun tan to the next level. The + Bronzing will enhance, deepen and prolong your natural sun tan. The cool BLUE colour of the bottle perfectly compliments the lotion within. Ultra light, the oil free formula spreads easily and absorbs instantly leaving a weightless dry touch feel, so its perfect to use as your everyday moisturiser and pre-tan melanin booster in one. It will also become your to after sun lotion. Enriched with soothing Aloe Vera and anti-oxidant Vitamin E to soothe and protect skin post sun exposure, Melanoboost Peptide Sun Tanning Lotion provides hours of hydration to quench any after-sun tightness and prevent peeling, contributing to a longer lasting tan. Whichever Melanoboost peptide powered product you choose, one things for sure it will help you achieve your tanning potential! ​WARNING - This product provides no protection against harmful UV rays and does not protect you from getting sunburnt. Avoid excessive exposure to direct sunlight. Repeat exposure to unprotected skin may increase the risk of aging, skin cancer and other harmful effects.